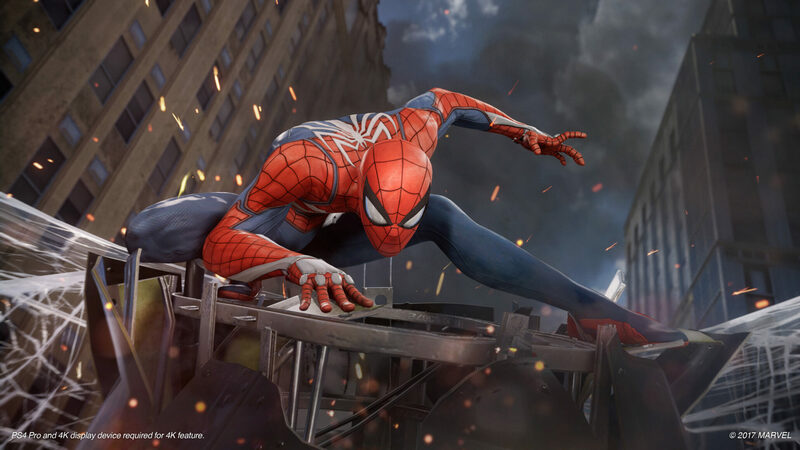 Insomniac’s Spider-Man game was one of the most anticipated ahead of Sony’s E3 2017 press conference and it fully delivered. We got our first look at how the game plays in pristine 4K resolution, with footage captured directly from the PlayStation 4 Pro console. Marvel Games Executive Creative Director Bill Rosemann talked a bit more about the game in a post published on Marvel.com. We hope that gave you a taste of the amazing abilities of our 23 year-old Spider-Man. After battling for eight years to keep the city safe, Peter Parker is an experienced and confident hero who combines wall-crawling, dodges, aerial combat, parkour moves, self-made tech, and his world-famous webs – oh, and also his whip-smart wise cracks – in an acrobatic, intelligent and improvisational combat style. And did I mention our obsession with bringing you the ultimate expression of web-swinging? In addition to celebrating Spider-Man’s spectacular powers, we’re also showcasing his awesome rogues gallery and supporting cast, which – if you connected the dots in the gameplay – includes the fearsome Mr. Negative, whose alter ego just so happens to be Martin Li, the philanthropist that Peter’s Aunt May works for! If there’s one thing everyone working on the game has learned after reading, watching and playing everything Spidey, his best stories focus on the sparks that fly when his civilian and costumed worlds collide. Speaking of worlds colliding, while we’re exploring the classic themes of power and responsibility, we’re also combining familiar faces with newer characters that you may not have yet encountered, all swirling together in an unpredictable and changing Manhattan. The officially revealed features also hint that the game will explore Peter Parker as a character, too. Insomniac’s Spider-Man is coming exclusively to Sony’s PlayStation 4 in 2018, meaning that the game will miss the hype train of upcoming movie Spider-Man: Homecoming. However, this will be an entirely different story featuring a more mature Peter Parker and Marvel made the choice to avoid tie-ins in favor of original stories that don’t necessarily release at the same time as the movies. This choice can definitely pay off from a creative standpoint. Stay tuned for more on Insomniac’s Spider-Man as we get closer to the release date.